Bouncing back is about resilience. No one escapes falling down, But what ultimately defines us as human beings is how we rise after falling. This personal development audiobook helps you to bounce back from life's setbacks and grow through adversity. In a world of constant change, we are often faced with the challenge of reinvention. 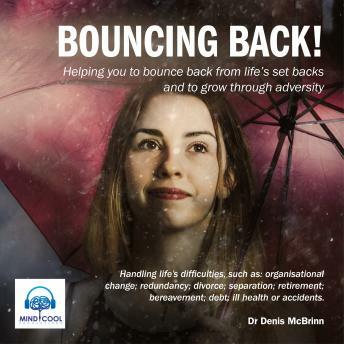 This audiobook will provide practical guidelines for gaining strength and becoming more skilful at handling life's difficulties, including: organisational change; redundancy; divorce; separation; retirement; bereavement; debt; ill health and accidents. Resilience is the inner strength that enables us to grow through difficulty and adversity and become a better person. No one escapes pain, fear and suffering. It is all part of being human. Yet from pain can come wisdom; from fear courage and from suffering can come strength " if we develop the power of resilience. Mankind has known this for thousands of years. All the great religious and philosophical teachers have taught about enduring the storms of life to grow stronger in spirit. Storms make oak trees take deeper roots, in the same way that the storms of life can make the trees of our human spirit take deeper roots.